Who doesn’t want to live in Rivendell? 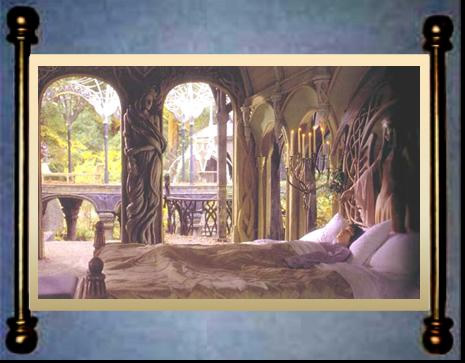 Well, if your nearest travel agent can’t get you there, we’ll help you have the next-best thing – rooms styled for a Half-Elven Lord! Look for books of Celtic or Norse patterns or clip art, which look quite Elven. Enlarge pattern on a photocopier, transfer to MDF or plywood, and cut out to make a lovely headboard for a bedroom or wall art for a living or dining room. Alternately, photocopy patterns onto overhead master sheets (the transparent plastic ones–get them at Kinko‘s or any good photocopy or office supplies store). Then borrow an overhead projector, throw them onto the walls and paint over the projected pattern for gorgeous murals. Paintings or large posters of trees, flowers, or other greenery helps set the mood. Stencil or paint ivy around doors and windows to soften angles. Find a large outdoor flower pot or urn painted white, or with patterns, again in the Celtic style. Fill with large, bushy plants, like Boston or asparagus fern. You can also use willow branches for a more rustic look. Cover the ceiling with very light fabric, like muslin or gauze, making it billow and creating a soft, curvy ceiling. Secure with a staple gun, or use tacks hidden by the fabric. Important safety note: Be careful not to hang the fabric too close to potentially hot lighting fixtures or electrical outlets! You could also dye the fabric dark blue and have fairylights (Christmas lights) between the ceiling and the fabric, replicating the night sky. Be sure all electric lights are in good working order, and they do not touch fabric. Do not use metal tacks to secure string lights to the wall or ceiling! Duct tape is a safer alternative. Rivendell isn’t Rivendell without flowing water! Get yourself a fountain. There are so many beautiful ones now, and they are no longer expensive. Look for one that with an elf-stone look. You could even consult your local craft shop and ask for help in designing your own. All the shops do that now, and carry the parts and accessories. For window treatments, attach long willow branches to the top of windowsills and hang draping, gauzy, light-filtering fabric from them. If you don’t have a window, why not create the illusion of one? Find a huge size poster of some outdoor scene–for example, a forest in autumn to go with warm colors or a winter scene to go with cool. Frame with willow branches all around. Next page: Canopies, cover-ups and special touches! This works for a bed or even a sofa in the living room. You’ll need plenty of gauze, very light muslin, or other fabric of your choice–a silvery one would be lovely. Measure from ceiling to floor and add about 2 ft. for gathering/draping. Sew together panels. Always use more than you think you‘ll need – no such thing as too much here! Gather the top ends and make a big, loose knot. You‘ll then need a large hoop.. The largest-size embroidery or macrame hoops, about the size of a bike wheel, work well for this. Fasten the material to the hoop with well-spaced stitches. Hang all from the ceiling over your bed or sofa with a ceiling hook. Make sure that it is long enough to trail on the floor as this will give the softest, most romantic look. So that 70’s orange-striped loveseat your Grandma gave you, or the Hello Kitty bed set left over from your childhood, don’t exactly scream “Arwen was here”? No problem! Muslin to the rescue again! Living room … Sew panels together, wide enough to fashion a graceful throw for your sofa. Remove cushions and drape it all the way to the floor; tuck in all around. For cushions and pillows, simply cut out two pieces for each, a little larger than you need. Place cushion or pillow on wrong side of one piece and cover with the second piece, right side up. Gather corners together and tie in a nice knot. Voila! Replace on sofa and there you are! Bedroom … Once again, dye to suit your tastes, and sew panels together to make two big rectangles, each a little larger than your bedspread or comforter. Place one piece on the floor wrong side down. Put your old bedspread or comforter on top. Cover with the other rectangle, right side up. Pin sides together and topstitch all around. To keep the spread from moving later, add silvery threads through all three layers, spaced throughout the spread, knotted or tied. Gather pieces of muslin and stitch all around the borders of an old sheet the same size as your bed for a matching dust ruffle. Pillow shams can be constructed like the spread cover. Throw pillows can be covered and tied at the corners. End tables can be covered with matching or complementing fabric–silver would be wonderful! 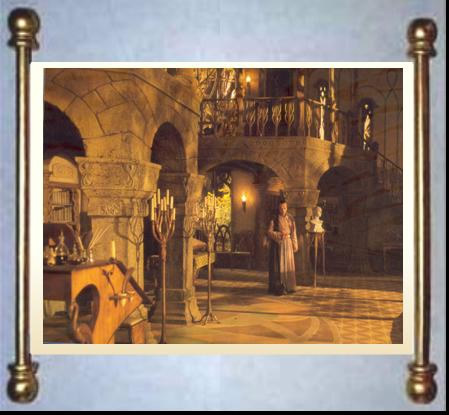 Turn your dining area into a Council Room by framing maps of Middle-earth or even antique-looking maps of this one. Pass by modern-looking plastic frames and choose pewter or silvery ones with scrollwork, or fine wooden ones. Fine glass or crystal goblets on a silver tray or antique salver works for any room. Cover old chairs with suitable fabric. Modern chairs can gain a new (or ancient) life this way; too-contemporary styles can be painted white or black, or even silver. Drape a dining table with a gauzy or lacy tablecloth. If you have a fine wooden table and don’t wish to cover it, leave the wood exposed but set it off with a nice silver bowl filled with green pears, apples, or grapes. Garden statuary can bring a marvelous sense of Elvenhome inside any house. Search your local garden center or discount stores for marble or weathered-stone looks in busts, faeries, dragonflies, etc. and use as art pieces. Candles, candles, candles! Look for pewter candelabra or candlesticks that fit the style. Remember that creativity and fancy are more important that what’s in your checking account. Now that you have your imagination fired, turn it loose and let it lead you home to Imladris!